Jewish Book Fair: Ma Baseema: Middle Eastern Cooking with Chaldean Flair. Discussion of the book with a cooking demonstration and tasting. WISDOM is a sponsor. 11:30 AM at the West Bloomfield Jewish Community Center. More information below!! Interfaith teen event at the Muslim Unity Center as part of the Face to Faith initiative. See information below!! “Rembrandt and the Face of Jesus” – an interfaith panel program, sponsored by the Interfaith Leadership Council, will be held in conjunction with the Rembrandt exhibit from 3:00 pm – 6:30 PM at the Detroit Institute of Art. There will be a charge for this event. Go to www.detroitinterfaithcouncil.com to register. More information below!! Make interfaith beaded jewelry bracelets with Nomi Joyrich, owner of the Franklin Bead Works. Program will run from 4:00 – 7:00 PM at Unity of Farmington Hills 32500 West 13 Mile Road, Farmington Hills, 48334. Cost for attendance is $35.00 which will include beads, charms, staff time and a light supper!! See more information below. Kids Against Hunger Project – Community Service project to package dry meals for the hungry in Metro Detroit and abroad – at the Rush Trucking Warehouse 38500 Van Born Road, Wayne, MI 48184. 2:00 PM – 5:00 PM. Contact Gail Katz at gailkatz@comcast.net or Paula Drewek at drewekpau@aol.com. See more information below. FRIDAY, NOVEMBER 11THThe 60th Annual Jewish Book Fair will present “The Essence of Chaldean Culture Through Food – A Tasting” on Friday, November 11 at 11:30 AM at the Jewish Community Center on West Maple Road in W. Bloomfield, MI. Join us for a culinary journey to one of the world’s oldest cuisines, dating back to ancient Mesopotamia. Demonstrating recipes from the new Chaldean American Ladies of Charity (CALC) cookbook, Ma Baseema, the presentation will also include a history of the Chaldeans, both in Mesopotamia and the Metro Detroit area. Members of the CALC will demonstrate making 2 foods: vegetarian dolma and baklawa. This program is co-sponsored by the Chaldean/Jewish Building Community Initiative – Arts & Culture Division and WISDOM. WISDOM presented its signature panel discussion “Five Women Five Journeys” at Christ Church Cranbrook on September 21, 2011. Shown in the photo are Ellen Ehrlich, Raj Chehl, Dianne Coin, Gail Katz, Peggy Dahlberg from Christ Church Cranbrook, Ranya Shbeib, and Fran Hildebrandt. WILL BE WAVING PEACE BANNERS!! THE DIVERSITY OF METRO DETROIT!! 1) The stories of the Holocaust have been documented, distorted, clarified and filtered through memory. Yet new stories keep coming, occasionally altering the grand, incomplete mosaic of Holocaust history. One of them, dramatized in a French film released here last week, focuses on an unlikely savior of Jews during the Nazi occupation of France: the rector of a Paris mosque. Muslims, it seems, rescued Jews from the Nazis. “Les Hommes Libres” (“Free Men”) is a tale of courage not found in French textbooks. According to the story, Si Kaddour Benghabrit, the founder and rector of the Grand Mosque of Paris, provided refuge and certificates of Muslim identity to a small number of Jews to allow them to evade arrest and deportation. 3) Nobel Peace Prize 2011 handed jointly to three womenThe Nobel Peace Prize has been awarded to Liberian President Ellen Johnson-Sirleaf, her compatriot Leymah Gbowee, and Yemeni women’s rights activist Tawakkul KarmanThe award was intended as a strong signal in favour of the empowerment of women in the developing world. Deepavali popularly known as Diwali, literally means a row (avali) of lights (deepa). In essence it is the celebration of the awakening and awareness of the Inner Light. This Inner Light, though not seen outside, outshines all darkness by removing all obstacles and dispelling all ignorance. When this inner realization blossoms then there is universal compassion, love, and the awareness of the oneness of all things. It awakens the individual to one’s true nature, not in the physical, but as the unchanging, infinite, and transcendent reality; the Sat (Truth), Chit (Consciousness) and Ananda (Inner Joy). This, for the Hindus, is the very goal of life. Monotheistic Hinduism’s original name is “Sanatana Dharma” or Eternal Order. Read more by clicking on the link below!! Diwali began on October 26th through October 30th!! Together to Learn From Each Other. About 60 Muslim, Christian and Jewish high school teens came together at the First Presbyterian Church of Birmingham on Sept. 22 for an evening of learning about each other’s faiths and teen-to-teen dialogue. They came to break down myths and stereotypes, increase respect and promote understanding. This was the second program in the series called “Face To Faith.” The first was held at a synagogue. In the main sanctuary of the church, the Rev. Amy Morgan gave a brief introduction to Christianity. She explained that the Presbyterian denomination of Christianity is one of 38,000 different denominations, and is oneof the “reformed” churches. She emphasized some of the similarities Christianity shares with Judaism – the Torah and the Old Testament, the communion meal that originated from the Passover seder, and the importance of the water in the baptismal font to the importance of the Jewish mikveh. The teens then went to the auditorium for treats and discussions at tables set up for interfaith interaction. They discussed stereotypes or misconceptions they had witnessed or encountered personally. Josh Morof, a Bloomfield Hills Andover High School senior and an active participant in the Jewish community, was the energy behind “Face to Faith.” He explained to the group that it was his idea to bring teens of different faiths together when he realized how much he learned from befriending a Muslim teen he got to know in his ceramics class. He shared his dream to break down the segregation of Jewish, Muslim and Christian teens in his high school and, after attending his school’s Challenge Day, he knew that it was up to teens to “Be the Change!” Three teens were then invited to the stage to take part in an interfaith panel discussion. Hiba Chaabi, an Andover High School senior, spoke about being a Muslim and how wearing the hijab was the favorite part of her religion because people knew from the start that Islam was very important to her. Rachel Berlin, a North Farmington High School senior and president of Michigan Region BBG, spoke about Tikkun Olam, or social justice, as being the most important feature of Judaism for her. Emily Held, a Birmingham Seaholm High School junior, shared that the hardest part of her Christian faith was trying to remember that the kids she didn’t like at school were also “God’s children” and she had to behave appropriately. The next Face to Faith event will be held at the Muslim Unity Center in Bloomfield Hills on Nov. 17. More than 40 distinguished philosophers and theologians from 16 countries have joined the condemnation of Iran’s policy to bar young Baha’is and others from higher education. In an unprecedented global initiative, the 43 prominent academics – of Christian, Hindu, Jewish, and Muslim backgrounds – have signed an open letter, published on October 10, 2011 in The Daily Telegraph (UK), and reported in the Folha de Sao Paulo (Brazil). The letter condemns in particular recent attacks by the Iranian authorities on an informal educational initiative of the Baha’i community – known as the Baha’i Institute for Higher Education (BIHE) – in which Baha’i professors, debarred by the Iranian government from practicing their professions, voluntarily offer their services to teach young community members who are banned from higher education. Another prominent figure to add his name to the list is Hilary Putnam, Cogan University Professor Emeritus of Philosophy at Harvard, U.S.A.
“Ever since the American and French revolutions at the end of the eighteenth century, the aspiration of peoples of different ethnicities, nationalities, and creeds for their fundamental human rights, including the right to worship as one’s conscience dictates and the right to education, have gained momentum,” said Professor Putnam. “The persecution of the Baha’i university students in Iran is a shameful attempt to turn the clock back to the dark ages. Their cause deserves the support of enlightened and moral people everywhere,” he said. Faith communities can make a difference. Agencies will have booths to display activities and opportunities to support children. We, the members of the Religious Leaders Forum of Metropolitan Detroit, are united in our concern for the dignity of every human being. Our entire community continues to be especially hard hit by the struggling economy. This has created a moral crisis to which we must respond. Therefore, we agree that it is our moral responsibility to advocate together for the well-being of all who live in our community. First, it is imperative that all people in our community have adequate warmth and shelter this winter. No one should freeze to death in our community this winter. Second, literacy among both children and adults is essential to the well being of all individuals and for the productive future of our whole community. Many of our congregations have established warming shelters and other support for those in great need. Some also provide literacy programs. We are committed to supporting existing programs by mobilizing volunteers, providing more facilities as appropriate, and taking other practical steps to address these critical challenges to the well being of people in metropolitan Detroit. We join together to pledge our attention and our moral leadership to seek comprehensive strategies from all our community leaders to address these critical concerns. We pledge our determination to work with them to help make those strategies successful. Says Metro Detroit producer and director, Evelyn Orbach, “We hear so much about bullying in schools and hate groups around the United States, including Michigan, so we can’t allow our young people to become desensitized to suffering from exclusion and discrimination. This play sends the message that one ordinary person can have a big impact and help make a better world. With legacy, we want to reach people, especially young people, and teach them about respect and valuing our differences.” Check out the flyer below for ticket prices and dates. On the 10th anniversary of September 11th I sat contemplating whether or not to attend Acts of Kindness Detroit for the National Day of Remembrance and Renewal. Part of me wanted to attend and be counted among those who were there to show solidarity between people of faith on such an important day while another part of me wished to draw my blinds and forget all about what that very day represents. Like so many I was feeling frazzled and emotionally burnt-out with the very nature of what this time of year brings as an American Muslim. With the extensive media coverage providing a constant reminder and the echoes of voices determined to demonize Islam the thought of attending such an event seemed daunting and futile. Yet another voice brought me back to the reality that as a Muslim I have the ability to change perceptions, shed light on the true teachings of Islam and connect with my neighbors on a level the media fails to touch on. The ultimate choice was to remain passive or to be present. As I entered the event I was awestruck by the diversity of people who had ventured out to honor remembrance and bridge together in the commonality of humanity. It was heartwarming to see many faces from the Muslim community sending a message to the world that we stand together with our fellow neighbors for peace and tolerance. Our mere presence sent the vital message that we are active members of society making a contribution to the good. As we performed acts of kindness with people of all faith traditions the positive energy grew nearly drowning out the negative stereotypes of the popular media. The welcoming smiles affirmed that we are all brothers and sisters in humanity-not separated by our differences but instead enriched by them. I knew with certainty that it was incumbent upon me to be present as a Muslim woman and to reach out to others as a human being first-starting in my own community. While waiting for someone else to take on that role surely that same some one was anticipating my action in bringing things to fruition. Yet, these opportunities belong to all of us. Had I remained immobilized by the climate of fear and doubt this moment of clarity may have never come. WISDOM, Women’s Interfaith Solution for Dialogue and Outreach in Metro Detroit is an organization you should not only be aware of but it is one that deserves your contribution and support. Despite the current climate of fear and Islamophobia that aims to discredit the faith of Islam WISDOM supports and respects all faith traditions while encouraging women to come together in faith and solidarity to make a difference in their immediate communities. For Muslim women in Metro Detroit WISDOM represents a ripe opportunity to contribute to the community on a local level while connecting with individuals who are open to interfaith dialogue and understanding. Five Women Five Journeys: How Different Are We? This unique WISDOM program features personal stories of women of different faith traditions – how their childhood impacted their beliefs today, what the challenges are for women in their faith tradition, what parts of their religion are misunderstood, how reaching out to someone from a different faith has enriched their lives. To inquire about a Five Women Five Journeys Program for your organization, contact Elaine Schonberger at bookfairmama@comcast.net or Paula Drewek at Drewekpau@aol.com . Check out the latest story about a friendship that crosses religion, race, or ethnic boundaries at www.friendshipandfaith.com. Email Gail Katz at gailkatz@comcast.net if you have a personal story for the friendshipandfaith.com website!! LINKS THAT YOU CAN USE FOR MORE INFORMATION!! 1) Go to http://www.readthespirit.com/religious-holidays-festivals/ for fascinating information about upcoming Religious holidays that your neighbors of different faith traditions may be celebrating!! 2) Go to http://www.readthespirit.com/were-making-news/ for a listing of all the articles written about the WISDOM Book Friendship and Faith: the WISDOM of Women Creating Alliances for Peace. BECOME A FRIEND OF WISDOM! Click on this link to go to the WISDOM website (right side of home page) to print out form to support WISDOM. 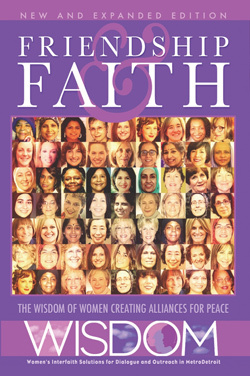 Friendship and Faith: The WISDOM of Women Creating Alliances for Peace. breaking book and spread the news. To Provide concrete modeling of women from different faith traditions working together in harmony for the common good. To Empower women to take a more active role in furthering social justice and world peace. To Dispel myths, stereotypes, prejudices and fear about faith traditions different from our own. To Nurture the growth of empathy and spiritual energy that result from our projects and interfaith dialogue. WISDOM is a Non-Profit Organization. Get involved with WISDOM! WISDOM’s challenge is to bring together people from different faith traditions, ethnicities, races, and cultures in an atmosphere of safety and respect to engage in educational and community service projects. Let’s change our world through the positive power of building relationships!